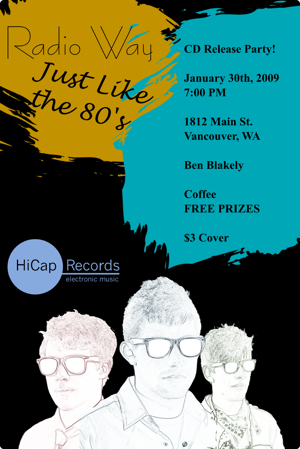 HiCap Records and Radio Way are throwing a party to celebrate the release of Radio Way’s debut EP, “Just Like the 80’s”. It’s being held at Compass Church at 1812 Main St., Vancouver, WA 98666 at 7:00 PM on Friday January 30. Ben Blakely will open for Radio Way, and there will be coffee available and free prizes. This event is open to the public, and admission is $3 at the door.